Title: '"FREDERICO AUGUSTO VERE AUGUSTO.POLON. LITHUAN. BOTUS. POMER. REGI DUCI PRINCIPI.SAXON UTR.DUCI.IMP......&." '. 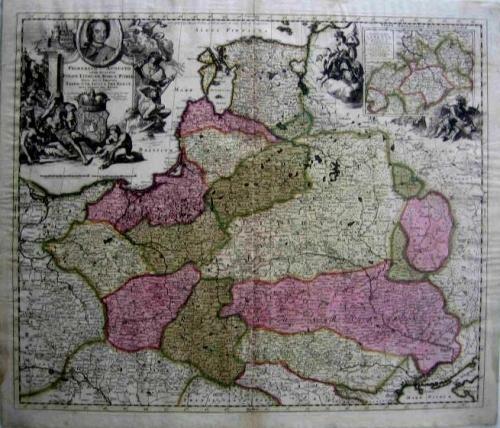 A very rare large Dutch map of Poland, Lithuania, Hungary and Ukraine by Peter Schenk. Inset of Saxony. This is a very decorative and detailed map. In very good condition woth good margins. There is a minor paper loss covered with the tape on back in the center (less than 1 cm long and few mm wide) and a hole at the upper left. Minor toning in margins. Overall very good and seldom seen on the market.